The complex sets of drives and calculations that we call morality rise from our basic human instincts toward reciprocity, fairness, and empathy. These instincts are called prosocial because they promote cohesion and harmony in the social context of herds, packs, and families. However, humans are not alone in having prosocial instincts. Many, indeed MOST, mammals show prosocial behaviors and instincts. It is interesting to ponder the question: if given enough time and selective pressure, would dolphins or chimps evolve into a society that includes established moral codes? I think there’s a good chance that they would. 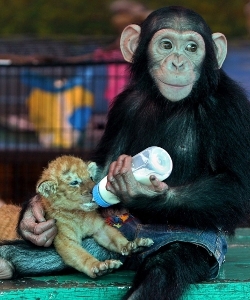 However, some intelligent species are less social and more competitive than dolphins, chimps, or humans. Tasmanian devils, for example, seem to have lost much of the cooperative- and empathy-centered instincts that most mammals have. These feisty little critters are solitary as adults and fiercely territorial. They seem to genuinely despise other members of their species. If they were to continue to advance in the evolutionary development of their cognitive and intellectual capabilities, what kind of codes would their societies write? This is a gloomy prospect and calls to mind some of the more brutal races of beings from the Star Trek and Star Wars lexicons. 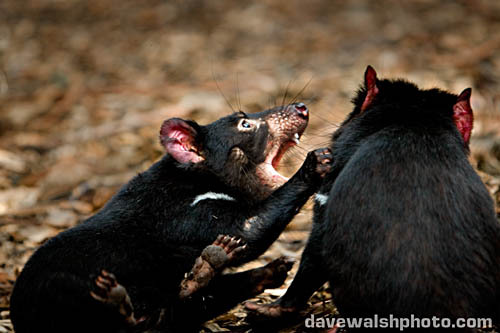 If moral codes flow naturally from social dynamics, a society of Tasmanian devils would make the Klingons seem cuddly. Then again, maybe the lack of prosocial instincts would prevent them from ever advancing that far in the first place. There is good reason to believe that the highly social nature of the Homo genus was at least partly responsible for our rapid cognitive evolution. With highly social living, the environment was ideal to develop things like cooperative hunting, communication, language, division of labor, and so on. In contrast, a species that lives a solitary adult life would have far less—or zero—pressure to evolve these skills. That is not to say that they wouldn’t advance in their cognitive skills at all, but an evolution along the route toward agriculture and civilization seems exceedingly unlikely as long as they remained antisocial. Perhaps the most fascinating prospect to ponder is what kind of societies and moral codes other species of Homo would have created had they survived. Modern humans are the only surviving members of our genus, but we were not always alone. Besides Homo sapiens, Neanderthals survived the longest and were the most like us. 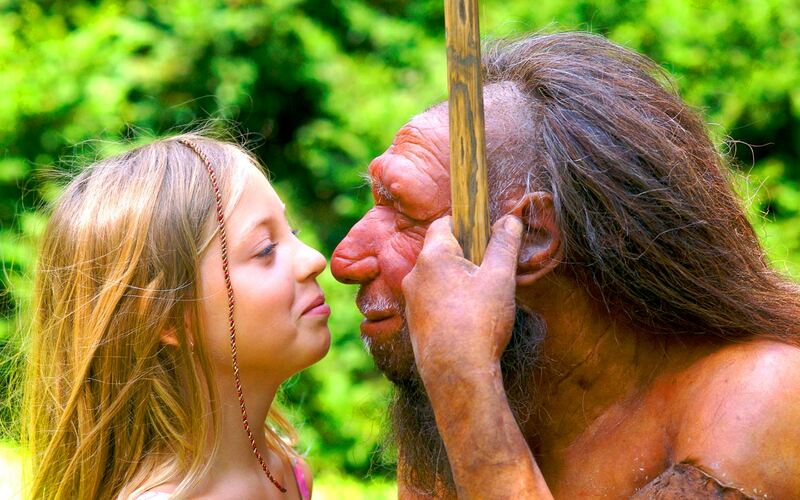 Neanderthals and modern humans are sometimes even classified within the same species: Homo sapiens neandertalensis and Homo sapiens sapiens, respectively. Neanderthals thrived in climates that we would consider very harsh and persisted for much longer than modern humans have existed to date. While anthropologists are still debating why modern humans completely replaced Neanderthals over just a few thousand years, Neanderthal artifacts reveal that they had social lives and customs strikingly similar to that of the modern humans of that era. They may even have ritualistically buried their dead with implements intended for use in the afterlife. 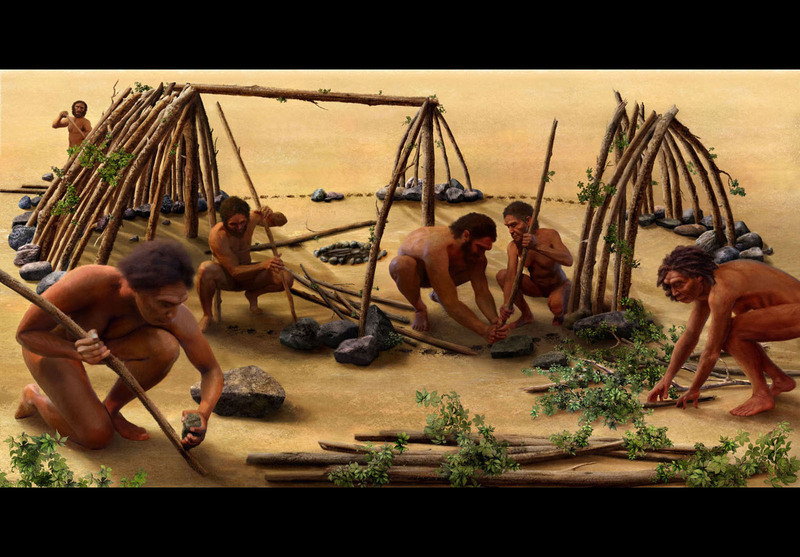 Given the apparent similarities in social structure and the likely continuing cognitive advancement of Neanderthals, it seems likely that they were not too far away from developing organized societies not unlike our own. What kind of morality would they have exhibited? It is important to remember that Neanderthals were not primitive early forms of humans, as many tend to think. In the analogy of a family tree, they are our cousins, not our ancestors. Humans did not evolve from Neanderthals: we share a common ancestor with them. That common ancestor lived around half a million years ago and did not perfectly resemble either Neanderthals or humans. Our common ancestor was more apelike than either of us and had a smaller brain and more limited intellectual capacity. That the Neanderthal lineage and the modern human lineage evolved many features in common—including advances in intelligence—is an example of parallel evolution due to similar lifestyle and selective pressures. 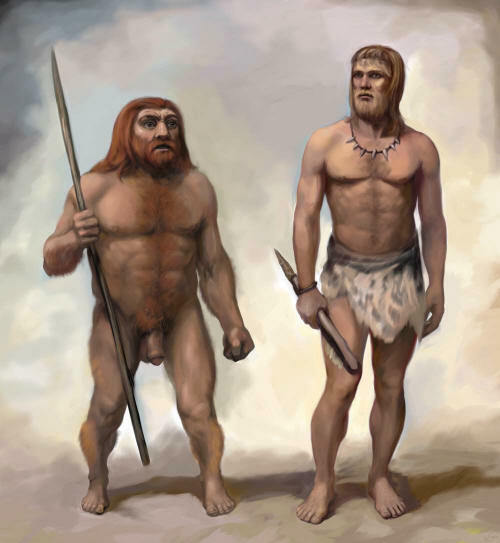 We both evolved features that aided us in hunting and gathering. The last Neanderthals perished only a little over twenty thousand years ago, so we can only infer what kind of society, culture, and morality they espoused. From what we do know, it was strikingly similar to our own history, a testament to the power of social-cooperative genetics. Humans and Neanderthals are just two branches of the Hominid family tree. Homo erectus and Homo floresiensis are two others, and once again, it is important to note that these are not human ancestors. They are also cousins, but more distant ones. These other species of Homo more closely resembled our common ancestor than we do, but this may simply be because we’ve been evolving for a longer time, while they have been extinct. During the times of these other species, the direct ancestors of humans, Homo mauritanicus and later Homo heidelbergensis, were also walking the earth. And before that, our earlier ancestor, Homo ergaster, lived and breathed along with Homo erectus, Homo hablius, Paranthropus robustus, and Paranthropus bolsei, all hominid species that more closely resembled modern humans than modern chimps. Recovered fossils have shown that, at one point in time, there were at least seven distinct species of hominids living at the same time. These populations undoubtedly had occasional contact with one another. Assuming that interbreeding was possible, they may have even exchanged genes and thus aided each other’s evolutionary potential. We’ll probably never fully appreciate why our family line survived and the others didn’t, but it was almost certainly more a matter of luck than anything else. Climate conditions on earth are constantly changing, and a species living in just a few places on one continent—especially when that continent is Africa—can easily succumb to ice ages, the transformation of a forest into a desert, and so on. Somehow our family line survived when the others didn’t, although it was very close. The protohuman population dwindled to as few as fifteen thousand individuals about a million years ago. Population contractions like that were not at all uncommon during the very harsh million years that our species evolved into its current form. However, we did survive, eventually leaving Africa in several waves and populating the entire planet in just a few thousand years. What if we hadn’t been the only ones to survive? What if the descendants of Homo habilus had had better luck when the lush Savannah of Eastern Africa grew hotter and drier a million years ago? Our species would have “grown up” side by side with another species of hominid that had similar abilities and genetics but was clearly distinguishable. All of the evidence points to a conclusion that the morality that this species would exhibit would be very similar to our own. After all, the moral codes of the separate cultures and societies of the modern and ancient worlds have far more in common than in contrast. Thus, it seems obvious that much of our morality is inborn, not learned. Our species, like that of Homo erectus, evolved from social-cooperative ancestors, but our prosocialism and cooperation was taken to the extreme, which then spurred the rapid expansion and development of our intellectual capacity. There is good reason to think that the same forces would have been present in Homo habilus, and the result would have been more or less the same. 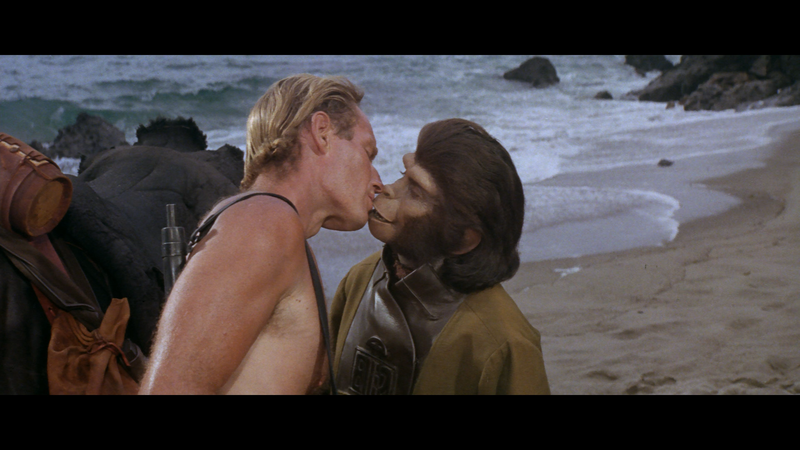 I can’t shake the Planet of the Apes imagery of it, but how much more interesting might our story be if more than one species of sentient hominid walked the earth? Reblogged this on a political idealist..
andava dal Mar Nero di un’Atlantide al Mar Caspio e da quest’ultimo al Lago Aral.